Is there a fine line between hackery in reporting, and pure truth? Recently I read a good article on beer journalism. The writer, Andy Crouch, discusses the traditional ethics and etiquette of journalism in relation to beer reporting. 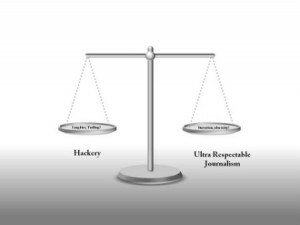 Do we adequately follow the traditional rules of journalism? Do we need to? This isn’t just good for the consumers who are hopefully trusting your judgment. It’s also important for you, if you want to retain your readership. Think about this: A craft beer consumer is looking for good beers to experiment with. He/she reads an article on how great X brewery is. The person gives it a shot, since any new experience is better than no experience. The person goes to X brewery and it’s the worst swill ever made. Who else loses besides the customer and X brewery? You do, because the beer drinker isn’t going to trust your reviews. Of course there are times when a blogger just disagrees with the public. Maybe you really did love X brewery. Maybe you had a certain beer that they do really well, while the consumer had one of their more middling offerings. That happens. That’s also why it’s important to mention any variables. Note in the article that you only tried the IPA, but not the barley wine. Make sure the readers know that you had it on tap, but you didn’t try the canned version. Also, it’s important to remember that you should treat styles you don’t like differently from beers that are just poorly made. For me, if I know I don’t like a certain style, I won’t review the beer. It’s not fair to the brewer, and it’s not fair to the person reading my article. The beer didn’t stand a chance of getting a good review (unless it’s really not the style it is advertised as.) In my mind, it would be better to find someone who does like that style and let them take over that review. Other factors may be in play that would make a beer “bad.” The tap line could be dirty. The beer could be old (and not meant to be aged). The fermentation could have been corrupted with unintended bacteria. Sometimes it’s impossible for you to know, but it’s good to keep these possibilities in mind. Maybe you could encourage your readers to post their opinions about the beer. You may find out that you are the outlier! Another conundrum that Mr. Crouch points to is the difference between sugar-coated writing and hard-nose, truth-in-print journalism. The ideal journalistic endeavor is to go where the story takes the writer, whether it looks negatively on the subject or not. They don’t dive into the controversy because they want to be invited back. Should they be disparaged for that? Is there room for both types of writing? As far as posting negative remarks—the contributors to Craft Beer Nation are honest in our reviews/blog posts. If something seems off style, we’ll say it. If a restaurant gives us bad service, we’ll say so. However, I am guilty of occasionally just not reviewing a beer if it’s really bad, and I personally like the people who brewed it. That’s something I need to work on. Then again, there’s something to be said about not burning bridges. What’s the right answer? Another taboo of yore is to receive compensation from the subject of your writing, whether it be a monetary contribution, a gift or a discount. All of these ideals are great to reach toward, but it’s not easy when you’re doing this for free. Personally, one of my happiest days was when the bartender at my bottle shop gave me the professional discount. She’s not there anymore, though, so I no longer get it. Maybe I’ll mention it next time I’m there. Mr. Crouch offered a happy medium. If you’re going to accept gifts, or if you do have a conflict of interest, then be candid about it. For instance, if you get a free case of Bourbon Stout, note it in the article. If your best friend opens a brewpub, it’s still ok to write about it…just don’t let your ties influence your opinion. Taking all of this into account will insure that you remain a respected commentator of the beer world. You may still be able to have your goodies, too.